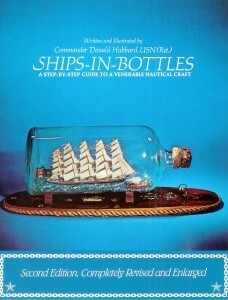 My book, Ships-in-Bottles was published in 1971 by McGraw-Hill who printed 15,000 copies. McGraw-Hill then sold the rights to the British publisher David & Charles in England who printed an additional 15,000 copies. David & Charles, in turn, sold the rights to Verlag Delius Klasing in Berlin, who translated it into German and printed 20,000 German versions. Several years later McGraw returned the copyright to me and I had another 10,000 copies made and sold. Total copies of this book out there: 60,000. And I figure that perhaps one out of every four buyers finally completed a bottled ship, so that book launched about 15,000 bottled ships worldwide. Not only that, but most of those models in bottles will probably last 500 years barring some world-wide cataclysmic event. So that is SOME legacy. Funny thing about this how-to book was that I wrote it after completing only about three bottled models. I reluctantly did the first one after receiving a request from a ship-mate who served with me at Guantanamo Bay during the Cuban Missile Crisis. His wife told me that he wanted a bottled model for his birthday. I could not find real any literature on the subject, and actually built the model after unearthing a plan from a February, 1931, Popular Science Monthly. With such a paucity of information I had the idea to write a PAMPHLET on the subject. I did so, and in my innocence submitted the idea to McGraw-Hill. They liked the idea, but THEY wanted a BOOK. OMG, now I had to write a book. My McGraw-Hill editor was Englishman with some exact ideas about wording and terminology, and before we had completed the book, our back-and-forth correspondence exceeded an inch in thickness. There were no e-mails or computers then, so everything was done on an old typewriter. Rejected/accepted pages were cut up and pasted as necessary, and editor’s proof-marks festooned the borders. I was fortunate with the necessary illustrations, because sometime earlier, while in the navy, I had learned to make good line-drawings, and I was a graduate of the Navy School of Photography, so I was able to take acceptable pictures. My editor (Mr. Walton Rawls) received an award for book design and the marketing people were Gung-ho, and did a wonderful selling job. The rest is history. 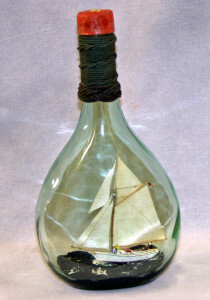 I have completed some 80 bottled models since then and co-founded the ships-In-Bottles Association of America, which has a world-wide membership. See www.shipsinbottlesassociation.org for more information. October 4th of each year is registered as National Ships-in-Bottles Day in Chases Calendar of Events.